Terror organization set up a 'cement factory' to disguise the tunnels, senior officer reveals. A senior officer in Northern Command said Wednesday that the Hezbollah terror organization was surprised and deterred by the operation to destroy terrorist tunnels on the northern border. The IDF has gained almost complete control of the Hezbollah tunnel project. Maintaining secrecy and the element of surprise has been a significant milestone in the success of the operation, which will last, according to assessments, for several weeks. "The chief of staff wanted to launch the operation two months ago, but we in the Northern Command asked for more time to organize and lay the foundation for preparing the operation," says the officer, who says that at no time was there a tunnel ready for use and that a period of months separates between the utilization of the tunnels and today’s reality. According to the information gathered in the army, the purpose of the tunnels was to enable Hezbollah's forward and rapid force to break out of the tunnels, to take control of central areas and routes such as Route 90, to 'cut off' the northern town of Metula or additional places, and then to allow additional forces to pass through the fence into Israeli territory. "I estimate that it is possible to destroy all the tunnels from Israeli territory similarly to how we operated in the Gaza Strip and not to enter into a confrontation at this stage with Hezbollah, which found itself very surprised and even retreated its forces due to the new findings," the officer says. As early as 2015, the army realized that Hezbollah was likely to have built an attack plan which included terror tunnels. For this purpose, the organization built seemingly innocent buildings and factories, such as a factory for the manufacture of blocks on the outskirts of the village of Kela in southern Lebanon. 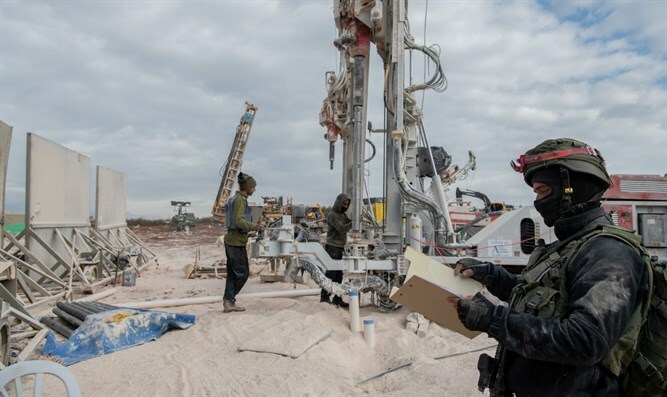 The camouflage for Hezbollah was perfect: a low, indistinguishable location, the removal of dirt and sand for a distance of about ten kilometers from the “factory,” daytime work only to prevent noise, a small team and a number of partners. "Finding a tunnel or tunnels along a 130 kilometer route was a difficult task," says the officer, explaining that the breakthrough came in the past year after a seismic mapping of the whole area: "We were already ready for action from the summer, but we postponed it to learn about the entire scope." The heavy bulldozers, the masses of workers, most of them civilian workers, and the technological devices that allow a glimpse into the tunnel's route can be seen on the ground. Dozens of meters separate the route from the Kiwi orchards of Metula and hundreds of meters separate it from the homes of Metula themselves. "Hezbollah has lowered its profile, but we are not taking chances, so the entire commando brigade is deployed along with fighters from regular units of the army, to provide a rapid operational response when necessary. If Hezbollah responds, the air force is ready which a large breadth of forces, as is the navy, and when everyone planned the big operation, everything was taken into account."